Ben Barker has enjoyed a fine start to the season with Peterborough Panthers. The city team will certainly be guaranteed a stern test when they entertain reigning champions Poole at the East of England Arena (7.30pm). Hans Andersen has suffered a slow start to the season with Peterborough Panthers. 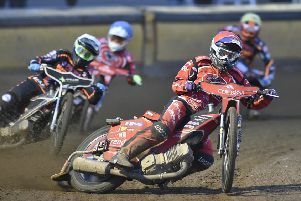 Panthers claimed a first victory of 2019 when dramatically pipping Wolverhampton in a SGB Premiership Supporters’ Cup clash last Thursday (April 11) thanks to the last-gasp heroics of number one Rohan Tungate. Now Johnson hopes his men can build on that victory by sending out a statement of intent with success against Poole in their league opener. “I can’t think of too many better ways of starting the league season than by beating the champions,” said Johnson. “It would be a great way to show that we mean business at this level and we’ll definitely be doing all we can to make it happen. “It goes without saying that it’s going to be a very tough test, though. But that applies to every meeting at Premiership level. Johnson is backing Panthers’ skipper Hans Andersen to bounce back from a miserable meeting against Wolverhampton. The Danish ace failed to score from four rides on a night when the city side saw a 12-point advantage wiped out before prevailing 46-44. Johnson added: “Hans had a difficult night on Thursday and I’ll have a chat with him today. Panthers continue to operate with the same septet that started the season with short-term recent Aaron Summers continuing for the time being. Johnson confirmed attempts to bring in a new rider have failed to come to fruition as yet. It is understood that British star Edward Kennett and Polish racer Kacper Gomolski were their top targets. Panthers reserve Ben Barker, who top-scored against Wolverhampton, continued his fine form with a 15-point maximum to win the Pride of the Potteries individual meeting at Stoke on Saturday (April 13) night. The Poole team is spearheaded by former Panthers man Jack Holder. The Australian ace starred for the city club in the SGB Championship back in 2017.